Bedrock has announced four retail tenants that are coming to the 1400 Woodward block in Detroit, immediately north of the former Hudson’s department store, which includes its Shinola Hotel as well as neighboring mixed-use buildings. The retail tenants will offer clothing, perfume, and raw juice. “We really wanted to create an authentic, one-of-a-kind experience in Detroit,” says Jennifer Skiba, vice president of leasing for Bedrock, part of the Quicken Loans Family of Companies. Once open, the stores will offer mostly locally made products with some national and international goods. 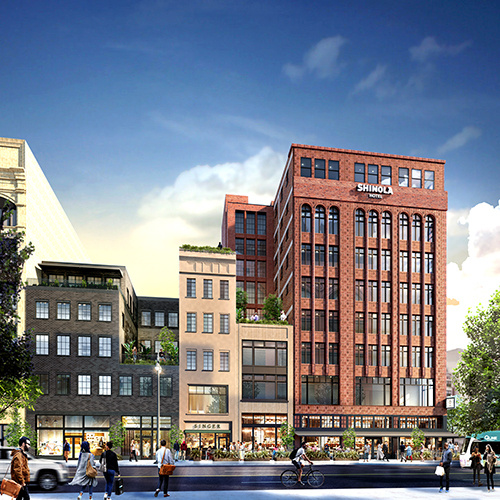 The Shinola Hotel will feature eight floors, 130 rooms, and 16,000 square feet of dining and retail space. It is slated to open in December. Good Neighbor, a men’s and women’s clothing and accessories store, will be located at 1435 Farmer St., Suite 115 along the east side of the hotel. The retailer donates a portion of its proceeds to local charities and comes from Shinola. This is the store’s first brick-and-mortar location. Madewell, another clothing store, will offers women’s casual clothes and is slated to open Tuesday. Located at 1426 Woodward Ave., located immediately north of the Shinola Hotel, it will feature a denim bar as well as tops, knits, jackets, dresses, and accessories. Drought, an organic raw juice company based in Berkley, will move its Chrysler House location to 1435 Farmer St., Suite 126 (east side of hotel). The final merchant announced is Le Labo, a perfume house by Estée Lauder. The location at 1434 Woodward Ave., located north of the hotel, will be the only Le Labo in Michigan. Good Neighbor, Drought, and Le Labo do not have definite opening dates, but Skiba says they will be open in time for the holidays. Bedrock has commitments for other retailers, says Skiba. They will be announced later and will open in phases.